The following reports provide information on major aspects of graduate admissions, enrollment, degree conferral, and student support. Data was extracted from official sources and has been authenticated. Staff members in the Graduate School Office of Information Technology and Analysis are available to answer questions and prepare customized reports. Please contact Steven Hunt for assistance. The reports below are web-based dynamic charts, graphs, and maps that provide self-service options for viewing the specific data you wish to see. Information available includes applications, admissions, enrollment, degrees, feeder schools, and others. Data often can be viewed by school/college, program, plan, domestic/international, residency, ethnicity, gender, and others. Note: UWM Office 365 account login required to view reports. A week-by-week visualization of graduate applications, admissions, and new enrollment for the past 5 years. User-customizable report that can be broken down by Semester, School/College, Degree Level, Citizenship, Academic Plan, Gender, Residency, and Country. Details & Errata “New Enrollment” in this case is defined as being admitted into a semester and enrolling for classes in that same semester. Production Schedule Fall: Weekly, December – September. Spring: Weekly, July – February. 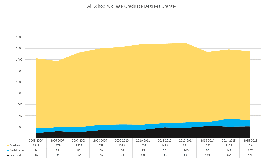 Week-by-week visualization of total graduate enrollment to date, compared to the previous 4 years. User-customizable report that can be broken down by Semester, School/College, Degree Level, New/Continuing, Citizenship, Gender, Residency, Ethnicity, Academic Plan, and Country. Details & Errata Week-by-week visualization of total graduate enrollment to date, compared to the previous 4 years. User-customizable report that can be broken down by Semester, School/College, Degree Level, New/Continuing, Citizenship, Gender, Residency, Ethnicity, Academic Plan, and Country. 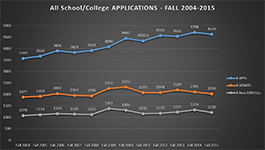 Academic year comparisons of total, official graduate applications, admissions, and new enrollment to date for the past 10 years. User-customizable report that can be broken down by Semester, Academic Year, School/College, Degree Level, International/Domestic, Academic Program, Academic Plan, Gender, Residency, Ethnicity, Country, and Online Status. One report that includes Fall, Spring, and Summer for each Academic year. Details & Errata “New Enrollment” in this case is defined as being admitted into a semester and enrolling for that same semester. Production Schedule Every Fall and Spring semesters after the 6th week of classes. 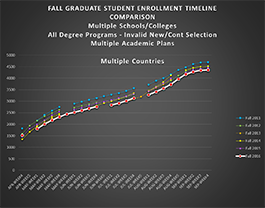 Academic year comparisons of total, official graduate enrollment to date for the past 10 years. User-customizable report that can be broken down by Semester, Academic Year, School/College, Degree Level, International/Domestic, Academic Program, Academic Plan, Gender, Residency, Ethnicity, Country, and Online Status. Single report that includes Fall, Spring, and Summer for each Academic year. 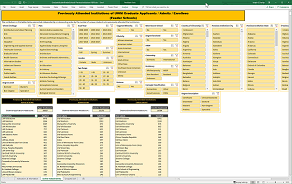 Details & Errata This is the total “official” UWM enrollment, using the “Statistical Master” data model. This model takes into account all students enrolled as of the 10th day of class in any given semester. Students who enroll later than the 10th day of the semester are not included. Students who subsequently withdraw are not removed from the report. Production Schedule Semesterly, after the 6th week of class. Report of graduate degrees and certificates confirred each semester, broken down by Master’s, Doctoral, and Certificates granted per adademic year. User-customizable report that can be broken down by Academic Year, Semester, School/College, Degree Level, Citizenship, Academic Plan, Academic SubPlan, Gender, Residency, and Ethnicity. Single report that includes Fall, Spring, Summer, and UWinterim terms for each Academic year. Details & Errata Degrees are often granted retroactively for previous semesters. As a result, this report may show higher degree counts for past semesters than older reports may have reflected due to the fact that more degrees have been issued for that semester since older reports were generated. Production Schedule Semesterly for Fall, Spring, and Summer, after the commencement ceremony for that semester. Report of how many enrolled students enrolled in Fall semesters either graduated within a year or were enrolled the following Fall semester. User-customizable report that can be broken down by School/College, Degree Level, and Academic Plan. Details & Errata This reports only considers graduate students for a given fall semester and the subsequent fall semester. If they either graduated during that year, or are still enrolled a year later, they are assumed to be “retained.” Students who were enrolled in a Master’s program for one fall and subsequently were enrolled in a bachelors program the following fall are considered to be non-retained. This report does not take changes in Program or Plan into consideration. Production Schedule Ad-hoc. Usually run after commencement for the Fall semester. A list of higher educational institutions attended by UWM graduate students before applying to UWM, and the headcount of attendees at those universities. User-customizable report that can be broken down by Academic Year, Semester, Term, Admission Status, Enrollment Status, Degree Received at Previous Institution, Most Recent Institution only, Citizenship, Degree Level, Residency, Gender, Ethnicity, Targeted/URM, Veteran Status, STEM, Carnegie Classification, Academic Program, Academic Plan and City/State/Country of previous institution. Details & Errata Previous institution data is somewhat spotty in PeopleSoft. For some students, this information isn’t captured at all, or captured improperly. For many international students, the previous institution is simply listed as the country they were in when applying to UWM. In the reporting data store, one data set lists only the most recent school attended (and is incomplete) and another data set lists all previous schools attended (and is slightly more complete). This query combines both data sets without duplication. 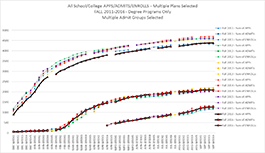 Due to missing data, totals for the number of students applying/admitted/enrolled will never match official counts of apps, admits, or new enrolls. Google Map of the top 15 countries from which international graduate applications were received Fall 2011-Spring 2015. Report has multiple, selectable “layers” to show data from only the most recent higher-ed schools, all previous schools, and others. A “Grouped by School” layer shows the number of applicants form that city by school/college. A “Grouped by Semester” layer shows the number of applications from that city per semester. Details & Errata Map shows count per city. “City” is pulled directly from the student’s application, which often leads to misspellings, typographical errors, and different ways of writing a city’s name. Due to these and other data irregularities, some applications are not included in this map. While it is possible to view multiple layers at once, it is recommended that you only view one layer at a time, as each layer contains a separate set of information. Production Schedule N/A – This report was a proof of concept and is not currently being updated on a regular basis. Data Sources VU_APPSTAT and XML source files of student graduate applications. Google Map of the top cities from which international graduate applications were received Fall 2011-Spring 2015. Report has multiple, selectable “layers” to show data for individual schools/colleges. from only the most recent higher-ed schools, all previous schools, and others. A “Grouped by School” layer shows the number of applicants form that city by school/college. A “Grouped by Semester” layer shows the number of applications from that city per semester. The reports below are tables of application, admission, enrollment, degree, and other data in static PDF format. Information is broken down by school/college, program, domestic/international, degree level, ethnicity, and others. This data is public and can be viewed without logging in. UWM’s Office of Institutional Research publishes numerous reports that contain information pertaining to graduate students. The links below will direct you to these reports on the OAIR web site. Additional reports can be found at the UW-Milwaukee Data Hub. Reports published by agencies external to UW-Milwaukee that give a broader picture of the university’s profile.